I think I’ve got a fantastic show on tap for you this evening with “Great Soul Performances.” You’re gonna hear on G.S.P. : Lou Rawls, the Temprees, Marvin Gaye, Jimmy Charles, the Staple Singers, Peaches & Herb, Little Stevie Wonder, Barry White, the Manhattans, the Temptations, my vocal group; the Laddins, Little Anthony & the Imperials, the final installment of my interview with Brook Benton, Freddie Scott; “live in concert,” and many others. It kicks off at 7PM ET, 6PM CT, 5PM MT & 4PM PT. You’ll want to hear this again, and to do so, all you need is the link, and here it is: http://radiomaxmusic.com/gsplisten.html. A reminder to tune into “Great Soul Performances 2: The 80s” on Wednesday at 7PM eastern time, for our tribute to one of the greatest artists and performers of the past 38 years, Prince. You won’t want to miss this expression of our love and grief over the loss of Prince Rogers Nelson. In the mean-time, and the in-between-time, I’ll see you later this evening for “Great Soul Performances” on RadioMaxMusic.Com. 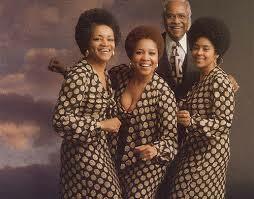 The Staple Singers were an American gospel, soul and R&B singing group. Roebuck “Pops” Staples (1914–2000), the patriarch of the family, formed the group with his children Cleotha (1934–2013), Pervis (b. 1935), and Mavis (b. 1939). Yvonne (b.1936) replaced her brother when he was drafted into the U.S. Army. They are best known for their 1970s hits “Respect Yourself”, “I’ll Take You There”, “If You’re Ready (Come Go with Me)”, and “Let’s Do It Again”, all of which (except “I’ll Take You There”) peaked on the Hot 100 within a week from Christmas Day.